I’ve found many incredible gluten free cookies from all over the world. Many are well known classics, such as almond macaroons and meringue cookies. Others are less famous, but are so good you’ll be very happy to know about them. As I add recipes I will include links to the recipes from the descriptions below. You can see a list of gluten free cookie recipes I’ve already posted here. Almond cookies include the well-known almond macaroons and almond paste cookies that have been popular since the early middle ages. One of my favorite cookies is an almond cookie called zimtsterne, which are traditional gluten free Christmas cookies from Switzerland flavored with cinnamon. They’re too good to save for Christmas—I make them year round, but in different shapes. Explore the almond cookie, and the amazing variety of almond paste cookies. 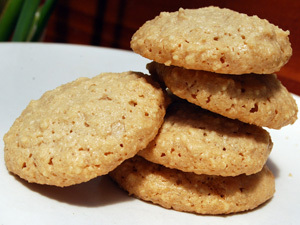 Brutti Ma Buoni, pictured here, are simple Italian almond cookies related to macaroons. They are really easy to make and taste wonderful! May be made with a sugar substitute. You end up with truly low carb cookies that are diabetic friendly. May be low fat. Many nut cookies are made without the addition of butter or oil, so they are relatively low fat because they contain only the oil of the nuts. May be made without nuts! If you have a nut allergy, you'll be happy that I use ground pepitas (pumpkin seeds) or ground sunflower seeds as substitutes when I bake cookies for my friend. She loves them! Share your favorite gluten free cookies! Do you have a favorite recipe for traditional gluten-free cookies? Or a story about some you found while traveling? Or a request? Please share your favorite cookie recipe or story here. We would love to hear about it! Gluten free chocolate cookies include chocolate meringues, macaroons, and French Florentines dipped in chocolate. Traditional cookie recipes start to get really interesting when it comes to coconut. From Nigeria I found shuku-shuku, Congolais from France, Quindins from Brazil, and of course macaroons. This may sound strange, but cookies made from beans or peas are popular in Asian cuisines. Yomoga Ga Shima are made from lima beans, and the Chinese make gluten free cookies from split peas and cornstarch. And don’t let glutinous rice scare you if you aren’t avoiding grains. The term refers to a type of rice that is sticky but does not contain gluten! Other flourless cookies include cassava cookies from Nigeria, walnut cookies from Iran, and peanut cookies from Brazil. In Scotland macaroons used to be made with leftover mashed potatoes. If you happen to have a recipe please share! Rice cookies are very common, and well-loved, in China. In addition to Chinese New Year’s cookies, there are almond cookies and tea cookies. Some of the cookies are baked as usual, but some are steamed, like steamed date “cakes”. Mexicans make gluten free cookies with corn masa, called gorditas de cuajada. Corn flake cookies are traditional in some US families, and I even found some in an old Jewish cookbook. Flapjacks are a gluten free “biscuit”, as they are known in their home country of Britain, that are made from oats. They are really easy to make and delicious. IMPORTANT! If you are wondering why I include oat cookies, or don’t know that eating oats is questionable for people with gluten intolerance such as Celiac Disease, See Are oats gluten free?